I was born and raised in London, England where I received a Bachelor of Science in Medical Laboratory Sciences. In 1989 I moved to California with my husband and 2 sons where I began my studies in art. I currently reside in the Bay Area where I exhibit my work and paint full time. My media of choice is collage and mixed media. In my collage paintings I work with recycled magazine papers. I love searching for papers that have interesting text, images and textures and then fitting them into my collage. Sometimes this process is reversed and I can spend quite some time searching for the “right” papers to complete a painting.In my mixed media paintings I use acrylic paints, Japanese papers or papers that I have designed myself. I use acrylic paints and inks to create papers with interesting designs and a range of values and colors. My love of texture, pattern, shape and color is reflected in my figurative paintings and semi abstract city scapes. I enjoy creating interesting and complex layers, these layers reflect the complexity of life. In life the more we get to know and observe people and our surroundings the more we will discover. I hope that when someone views my paintings this will also apply. I am a member of The Los Gatos Museum Gallery where I have exhibited my art for the last 4 years. My paintings have won numerous awards in National and Statewide shows including The Triton Museum of Art, The California Watercolor Association and the International Society of Acrylic Painters. 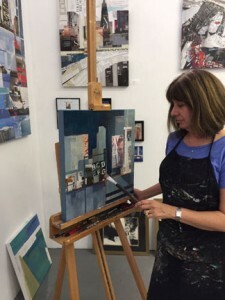 I am an active member of several art associations including Allied Artists West,abstract7 and I am a signature member of the International Society of Acrylic Painters.